Doug Ford Promised a Fully Costed Platform. Where is it? Should political parties be expected to put before the voters a fully costed program for Government, showing what they’ll spend and how they are going to raise the money to pay for it all? This morning, the Liberals and NDP are trading blows about alleged “major mistakes” in the NDP’s campaign platform. But at least they both have one. We are now into the second week of the campaign and Ford’s Progressive Conservatives have yet to publish their costed program. 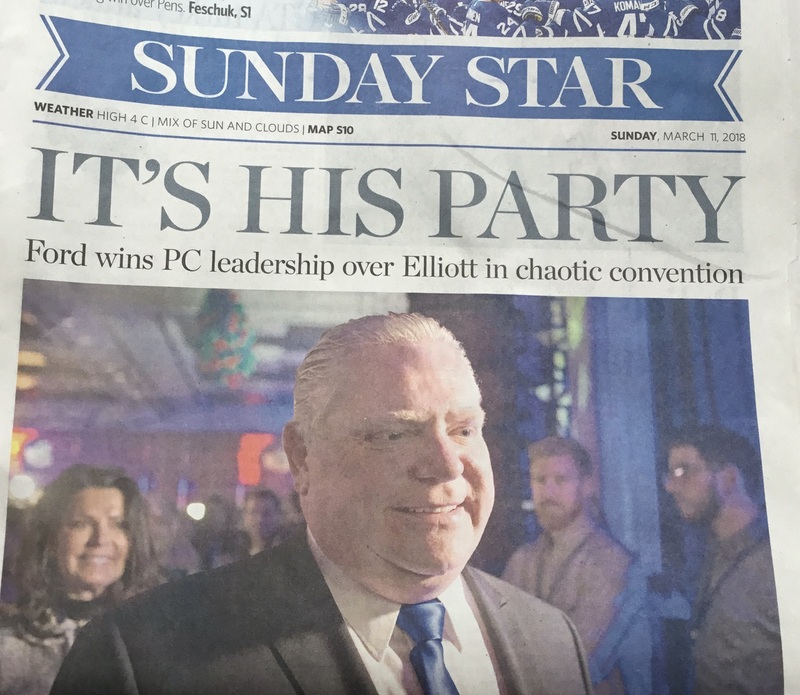 The CBC reminds me that Doug Ford went into the provincial election campaign promising a "solid platform that is fully costed." "I don't think you will see a fully costed platform because I don't think they know where the money is going to come from." Ford at various times has told us he is going to cut taxes by 20% for the middle class; cut corporate taxes; cut hydro rates and eliminate provincial taxes for anyone earning less than $30,000 a year. He has mused aloud about scrapping the foreign buyers tax on real estate and cutting provincial taxes in their entirety for doctors practising in the north. He has set his face against a carbon tax, losing the $4 billion in tax revenue that Patrick Brown had factored into his “People’s Guarantee”. He is going to find $5 billion for new subways and transportation initiatives. He is not going to cut public service jobs and he is going to pay for his program through efficiencies such as joint purchasing that will deliver 4 cents in savings for every dollar. He is going to bring down the Provincial debt and balance the books. He pledges to increase spending by $13+ billion while cutting taxes. No. I don’t believe it either. We cannot take Ford on trust any more than we should believe Trump when he says (or used to say) that he will publish his tax returns. It is simply not going to happen. In the absence of a costed program, PC policy commitments are what Ford, speaking ex cathedra, says they are. When he took over from Patrick Brown, Ford declared the People’s Guarantee dead. Then he said he would change about 10% of the policy platform. Then he just starts making it all up as he goes along. Ford has piled up so many billion-dollar spending commitments on the fly, coupling them with tax cuts, that it would now be impossible to craft a program that adds up. The Ontario Chamber of Commerce evidently thinks so. That sounds OK to me. Does the Aurora Chamber of Commerce have a view on that? And, if not, why not?